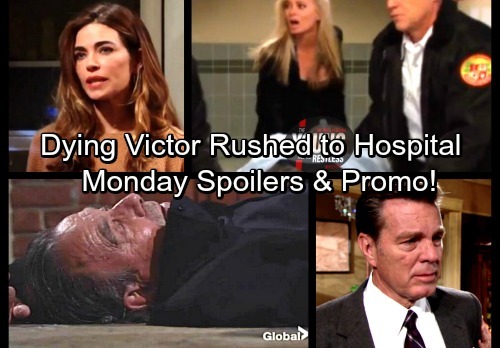 The Young and the Restless (Y&R) spoilers for Monday, March 26, tease that Victor’s (Eric Braeden) life could be at stake. After a fierce faceoff with J.T. (Thad Luckinbell) on Friday, Victor is left unconscious at the bottom of a staircase. Taking a blow to the head like that is serious business. Victor needs medical attention right away, but J.T. may not be in the mood to help him out on Monday. Instead, J.T. may take off and hope that Victor doesn’t live to tell the tale. He won’t want Victoria to find out that he once again did something so horrific. However, Victoria will definitely have some questions about J.T.’s whereabouts. She’ll reveal that she’s been trying to get in touch with him, so J.T. will have to think fast and come up with an excuse. Meanwhile, Nikki (Melody Thomas Scott) will be busy living it up with Arturo (Jason Canela). Her bedroom fun will leave her oblivious to what’s going on back at the ranch. Who will ultimately find Victor’s dying body and how long will it take? There’s no word on that yet, but Ashley (Eileen Davidson) will at least be concerned. She leaves Victor a voicemail on Friday and warns that Jack may be coming. It’s possible that Ashley will find Victor and accuse Jack of attacking him. However, it might be even soapier if Jack’s the one who sees his fading enemy. He’ll be drunk and furious, so he could be tempted to leave Victor there to die. The Young and the Restless spoilers say we might see a real dilemma. Nevertheless, Y&R fans know Jack has a good heart deep down. He’d probably call for an ambulance, but that would still put him at the scene of the crime. You can bet that Jack will face accusations from Paul (Doug Davidson) and Christine (Laralee Bell). No matter who finds Victor, Jack will be at the top of the suspect list. Jack also has another round of shocking news coming his way soon enough. Abby (Melissa Ordway) learns a major secret from Dina (Marla Adams) on Friday. Dina claims that Jack isn’t a blood Abbott, so someone besides John (Jerry Douglas) is supposedly his father. Whether those comments are true or just the ramblings of an elderly woman with Alzheimer’s, Jack will have to get updates eventually. Some huge bombshells are still to come, to stay tuned for more drama. We’ll keep you posted as other Young and the Restless details emerge. Stay tuned to Y&R and don’t forget to check CDL often for the latest Young and the Restless spoilers, updates and news.